The Peterson 34 went into production at Texas-based Island Yachts/Composite Technologies, and 92 were built until production ceased in 1981. Composite Technologies, established by boatbuilder Andy Green in Corpus Christi, Texas, was acquired sometime around 1976 by boatbuilder and rigger Marion Hayes. Hayes renamed the company Island Yacht Corp. and relocated production to League City, Texas. It was during this era that Peterson’s designs dominated offshore racing, with winning IOR boats Gumboots, Eclipse, and Ragamuffin. 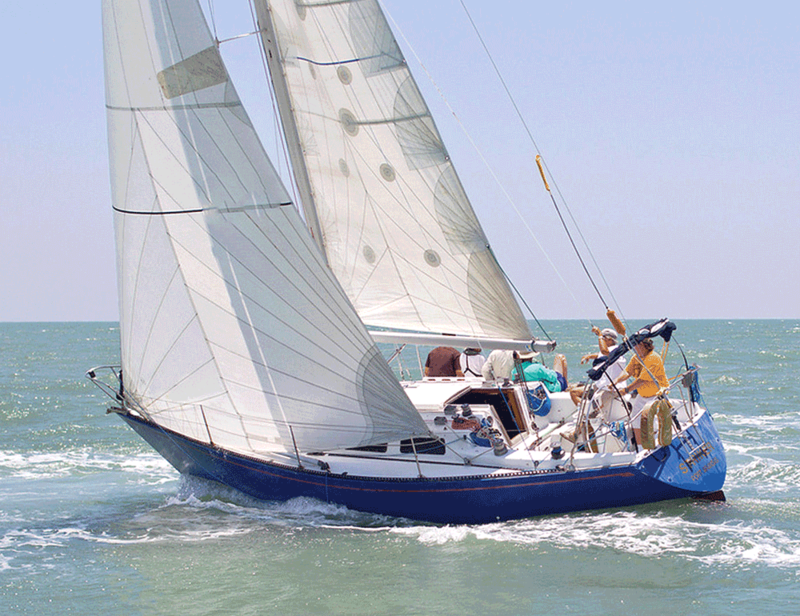 He also designed several stock racers such as the Contessa 35 and the New York 40. The Peterson 34 is as fast as it looks, and this quality solidified Peterson’s reputation as a designer. The sloop’s profile from abeam is sleek, the sharp cut bow and reverse transom give the boat a sense of forward motion. The dimensions are well proportioned—the 11-foot 2-inch beam is just about one-third of the boat’s 33-foot 11-inch overall length. The smooth, rounded deck contour is clearly designed to shed seawater. The compact cockpit, with its oceangoing bridgedeck, allows room for a tiller but little else. The traveler is mounted across the bridgedeck. Trimmers can easily reach the primary and secondary winches, none of which were originally self-tailing.